When you have celiac disease and don’t live near other gluten free eaters or fellow celiacs, it can be easy to feel alone or different. That’s one of the many reasons - along with raising celiac awareness and showing the nuanced ways celiac disease actually changes our lives - I love sharing these list posts of things that most (if not all) people with celiac disease experience. 1. 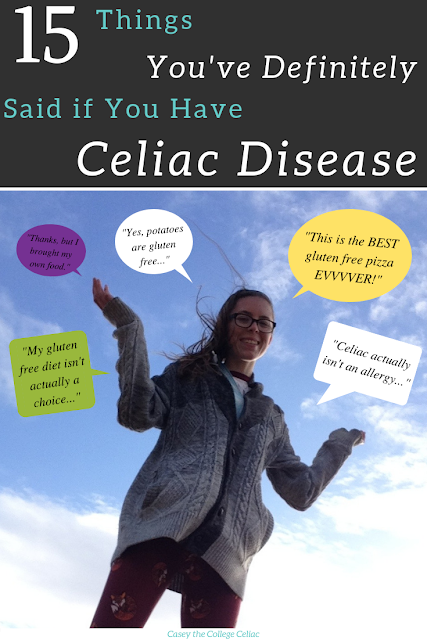 "Actually, celiac disease isn't an allergy..."
2. *Moans* "This. Is. The. Best. (Gluten Free) Pizza. I've. Evvver. Tasted." People often mistakenly assume that eating gluten free means you’re eating bland, gross or boring foods. But gluten free foods can actually be pretty dang delicious - and when we find something that tastes amazing, we’re definitely going to say so! 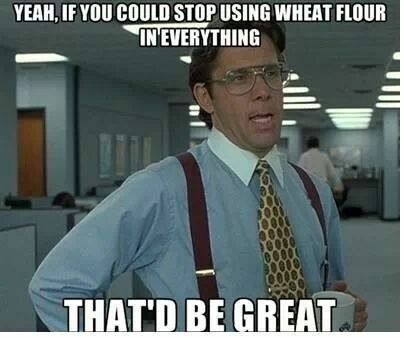 And if you have celiac disease and haven’t found a gluten free pizza, pasta, cake, etc. brand or recipe that makes you moan...know that they are out there. And you will be able to say this one day! 3. "No, vegetarian or vegan isn't the same thing as gluten free." 4. "Sometimes, I'd just reallly like to be able to eat a piece of bread." 5. "Am I bloated because I was glutened? Or just because...?" 6. "It's actually not a lifestyle choice. I have to eat gluten free." Cons of the gluten free fad diet: many gluten free options (especially in restaurants) are not actually celiac-safe...and it can be frustrating to constantly have to distinguish yourself from people who cut out wheat to lose weight. 7. "You won't believe the new product that just came out!!" Maybe not everyone with celiac disease is a foodie...but I think we can all appreciate when a new, amazing gluten free goodie hits stores! 8. "Thanks for the offer, but I brought my own food." 9. "You have celiac too?!?" 10. "No, I can't just pick the toppings off the pizza crust or bread." 11. 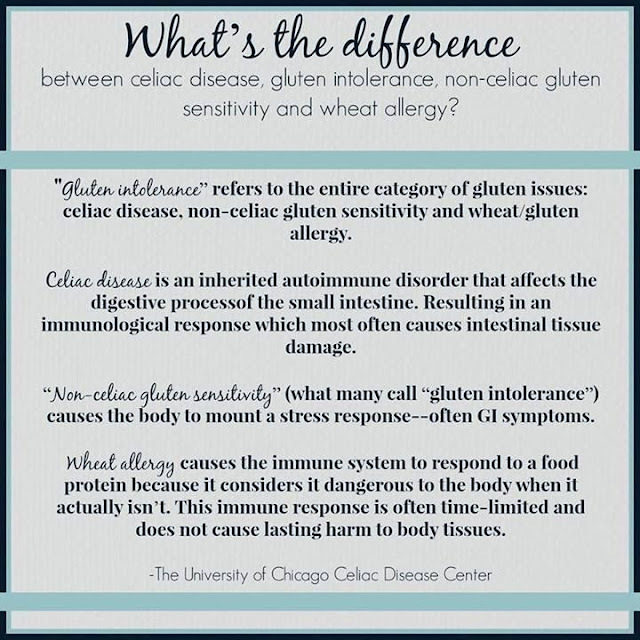 "Gluten intolerance and celiac actually aren't the same thing..."
Just like celiac disease isn’t an allergy, it’s not the same thing as gluten intolerance. I’ve written before about the controversial nature of gluten intolerance (some think it’s not real...and there are some studies that support that claim). But regardless of what someone thinks about gluten intolerance, it’s definitely not the same thing as celiac disease! 13. "No, I won't ever 'grow out of it.'" 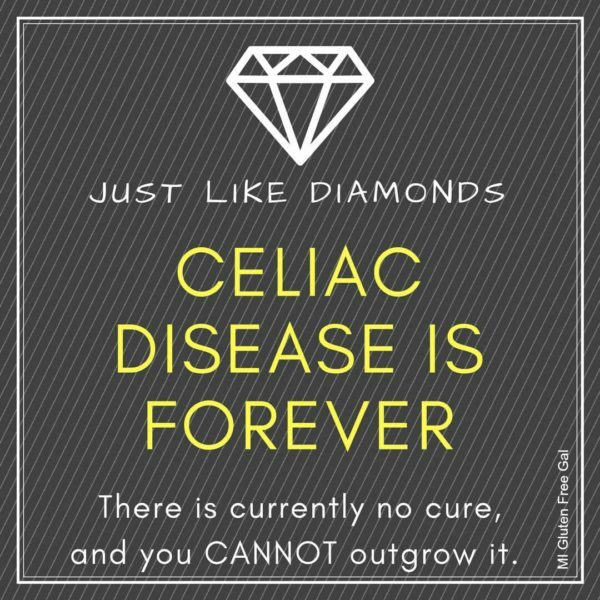 People are usually well-meaning when they offer suggestions on how we can “cure” our celiac disease or try to comfort us by saying we'll maybe “grow out of it”...but celiac disease is a lifelong condition, and the only treatment nowadays is a strict gluten free diet. It can feel suuuuper frustrating if you have to keep reminding people of these facts, over and over. But I'd encourage you try to focus on the positives: you may not grow out of celiac disease, but you can live a long, healthy life thanks to the gluten free diet! 14. "Yes, potatoes are gluten free." 15. 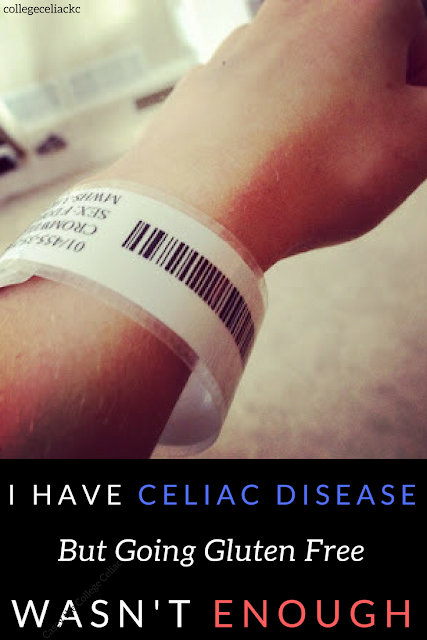 "Celiac disease can be freakin' hard...but I feel so much healthier now." 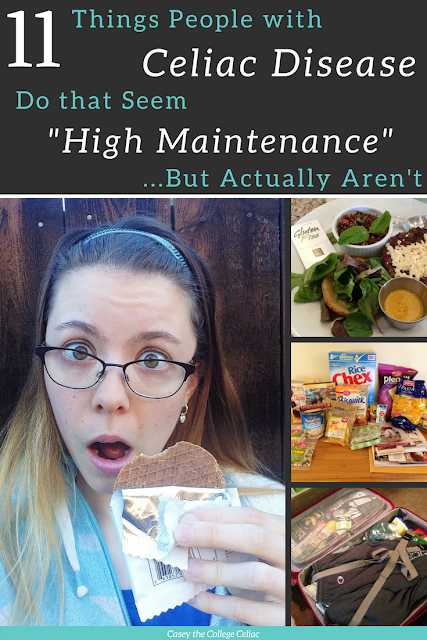 Like I’ve shared in previous posts, a celiac disease diagnosis changes waaaay more than just your diet. It changes how often and where you eat out, how spontaneous you can be, how you spend time with loved ones or significant others and much more. And sometimes all these changes are, well, freakin' hard. Thanks for sharing your experiences and advice. Sounds like you've been through quite a journey! Great article thanks! I used to wonder why vegan/vegetarian was even a thing in the GF community. Eventually it dawned on me: There's an advocacy alliance between food allergy groups and Celiac disease groups. Also, many people with Celiac have a problem eating dairy as well, and it's not always just lactose. For me, it's casein, although it's a matter of irritant load. For example, I recently dealt with a mold problem in my house. As soon as the mold levels were low, I could cautiously eat casein again. And I've been tested for milk allergy, there isn't any (of the IgE type). Yet if I am exposed to an allergenic or toxic thing like Stachybotrys mold, I develop an inability to tolerate casein! So the connection and alliance between the two communities is real and helpful. I keep as much variety in my diet as possible but it can be hard. I keep telling myself everyone is different and that's all part of the tapestry of life. I hope you're doing well, Casey! Everyone is weird somehow when you get close enough, nobody's perfect or problems-free. And all these unique challenges just help weed out the people who are too brittle to care deeply. Every day I give thanks that my husband is a deeply caring person who makes sure I remember my thyroid pill in the morning, and so many other things I may flake out about. Loving people do exist. They're just hiding because they get called "sappy." But a tree without sap is dead inside. That is a very interesting observation about the GF and vegan/vegetarian community. And I'm doing pretty well. I'm crazy busy with grad school and teaching and part-time jobs, but such is the life of a 20-something! I so appreciate you reading and commenting regularly, even if it takes me ages to comment back. And it definitely sounds like your husband is a great guy. And I LOVE the phrase "Ignorant and inquisitive is an act of caring, usually." <3 That's something I'm trying to believe more often!